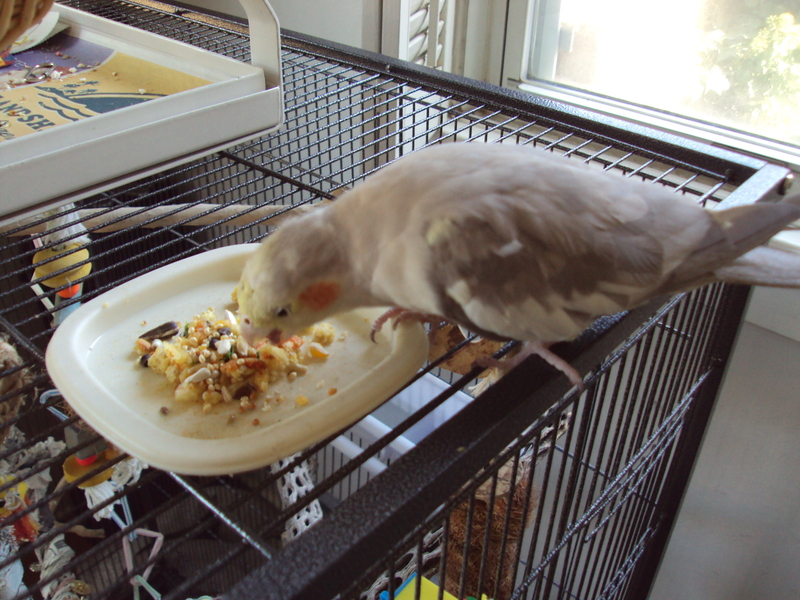 One of the most common misconceptions about cockatiels and other parrots is that they eat only seeds. Ask any avian vet, however, and you’ll find that this is not true! In the wild, cockatiels eat more grass seeds than their larger cousins, but they also eat grass sprouts, fruits and insects. For our companion ‘tiels, variety is vital to proper nutrition. and up the veggies and pellets. Of course, like most cockatiels, these little guys are “seed junkies.” They love millet and sunflower seeds! Like children though, they don’t always know what’s good for them. Seeds contain a lot of fat and calories (good for a wild cockatiel that flies many miles in a single day… not so good for our companions). 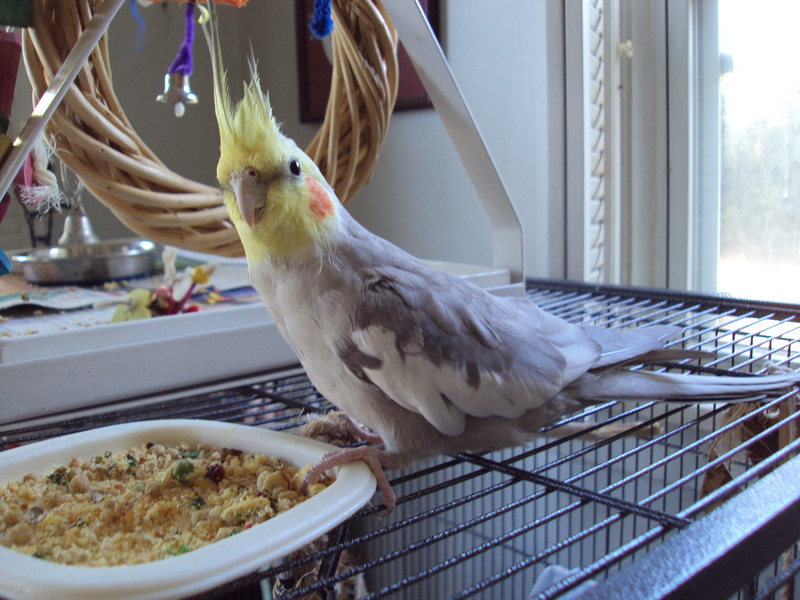 Pet cockatiels and other parrots that sustain on a 100% seed diet suffer from a host of problems caused by obesity and malnutrition. Most end up dying prematurely. The development of nutrient-rich pellets for our birds has helped a great deal, but they also can cause problems such as liver failure if eaten too much. The ideal amount of pellets in a parrot’s diet varies by species, and is still somewhat disputed, but my avian vet recommends that pellets consist of no more than 20% of my cockatiels’ diet. My birds are still picky about what they eat, so I always use this valuable trick: chop up everything into small, seed-like bits! I can get my ‘tiels to try just about anything this way. Another trick I use to get the birds interested in new foods is to lure them with some seeds sprinkled on top. It took some patience and trial-and-error, but tonight’s dinner is a winner – they especially love the birdie bread! We enjoyed your experience with popcorn. Similar for both our Tiels and our two budgies. But no salt or butter, right? They also eat eggs and chicken, but no bones like big macaws. Our 18-21 year old, we don’t know exactly, we adopted her, “Normal” Tiel Chirpa died recently, If you’ve had Tiels for 16+ years , first, you have been taking good care of them, and secondly they are similar in Tiel years to Cookie the Major Mitchell’s Cockatoo at the Brookfield Zoo in suburban Chicago, He is 80 human years old and the oldest living inhabitant of that place.